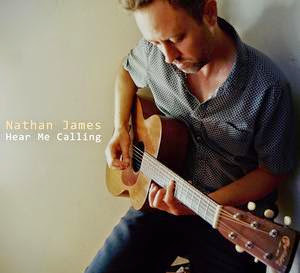 I just received the newest release, Hear Me Calling (November 28, 2014), from Nathan James and it has a real nice feel. This release is actually two separate releases in one, the first, Hear Me Calling, was inspired by field recordings by Alan Lomax. The second, Natural Born This Way, more New Orleans, Swamp Pop and Down Home blues. Opening disc one is title track, Hear Me Calling, a stripped down blues track with harp and resonator guitar. Look Before I Leap puts me in mind of Brickyard Blues, an old track made popular by James Montgomery. Clean articulate resonator playing brings a nice life to this track. Piedmont style track, Still I Wanna Know, is a bright finger style acoustic guitar track with James on lead vocal. Very nice! A boogie track with a twist, Doing The Same To You, has a Latin flavor and a finger style break. Interesting mix. Baby Where Did You Go has very classic delta blues styling and honesty. Possibly my favorite track on disc one. Curley Weaver's No No Blues is done with a lot of authenticity including falsetto vocals and slippery slide resonator work. Very nice! Lonnie Johnson's She's Making Whoopie in Hell Tonight is a real classic with solid guitar riffs and slide techniques. Look Out Your Window has a much more modern sound but with classic blues riffs. With a boogie rhythm this track rolls along really nicely. Don't Believe What People Say has the solid classic delta styling and simple but clever guitar riffs. Opening with a train like harp solo, She Don't Make A Scene, has a real nice swing to it. It's obviously more modern take on the blues with contemporary vocal styling but incorporating resonator to play the more modern interpretations of the classic riffs is quite cool. Wrapping the first disc is I Know I've Got Religion, a traditional spiritual blues. James keeps solid time on the resonator and demonstrates some of his best vocals on disc one. Opening disc two with a classic Freddie Fender track, I'm Gonna Leave, a 50's styled shuffle, James on vocal and guitar make good time with Marty Dodson on drums, Troy Sandow on bass and some particularly cool key work from Carl Sonny Leyland. James throws down some classic trem bends on his stylized guitar solo. Look Out Your Window is a cool bluesy track with drone note guitar rhythm and James establishing firmly his solid vocal skills along with some pretty cool country influenced guitar riffs. Natural Born That Way has a modified Latin rhythm that is really cool. James' guitar attack on this track really sets it off and Dodson's drumming anchors it. Very nice! Look Before I Leap has a twist of New Orleans reinforced by the solid piano work of Leyland. This is a slick track with a catchy rhythm and melody. On Earl King track, Take You Back Home, James sets a strong R&B swing. Big Jon Atkinson sits in on rhythm guitar giving James a chance to really stretch his lead guitar chops on this track. Very cool! Doing The Same To You is another track with a strong New Orleans influence but with classic rag style breaks. Another slick guitar solo and then heavily stylized piano playing from Leyland sets this track apart. Long John Hunter's Ride With Me is a hard driver with Troy Sandow leading the way on bass. Leyland and James trade rhythm leads throughout but James steps on it with a frantic guitar solo and Leyland comes back with almost a Jerry Lee Lewis style on piano. Smokin! Another Earl King track, It Must Have Been Love, sets a strong R&B path with James doing some of his richest vocals on the release. He also steps up with some of the bluesiest guitar riffs on this release as well. On The 5 Royales' I'm Gonna Tell Them, a Bo Diddley rhythm and gospel influenced vocals (with Dodson and Sandow adding vocal harmonythis track rolls along nicely with an overall cool sound and slick stylized guitar work. Cow Pies is a really cool blues shuffle featuring Sandow on harp and James on slide. My favorite track on this side! Closing the release Don't Believe What People Say is a tight blues track along the lines of Rollin' and Tumblin' with a nice easy pace. Leyland on piano sets a nice background for James' vocal melody. This is a cool release with a number of different takes on the basic blues theme.